Rogue Gateway Rotary Club has been involved with numerous projects over the years. The following are just a few. round out the festival experience. A combined effort of all four Rotary Clubs in Josephine County, the Josephine Community Library, and the Josephine County Library Foundation brought the Dolly Parton Imagination Library to families in Josephine County. The effort was aided by a $20,000, three-year grant from the Oregon Community Foundation. Dolly Parton’s Imagination Library is a book-giving program that mails free books to children every month from birth to age 5 in participating communities. Rogue Gateway collect donations and funds to fill some 200 backpacks for kindergarteners attending schools in Grants Pass and Josephine County. The backpacks, stuffed with tuna, peanut butter, granola bars and other food, plus gloves, hats, toys, crayons, books and other items, were distributed just before winter break. In addition to individual donations, AllCare Health gave the club $5,000 to ensure continuation of the project in future years. With the help of a District 5110 grant, Rogue Gateway donated several lap-top computers to Creating Opportunities for Guatemalans, a non-profit based near Antigua in Guatemala. The organization gives impoverished Guatemalans tools and skills that will lead them to self-sufficiency and improve their future by providing school sponsorship, after-school support, English, literacy and vocational training. Rogue Gateway member Ellen Johnson and Tommi Drake visited the school in 2018. Rogue Gateway became a ShelterBox USA Hero Club in September 2018 when it committed to raise $2,000 a year for three years for ShelterBox USA. The funds will be used to provide life-saving shelter and equipment to help families around the world rebuild their lives after losing everything to natural disaster or conflict. In response to a $1,000 anonymous donation, club members and their friends raised a matching $1,000, which was presented to ShelterBox representative Peggy Carlaw. Rotarian Frances Dixon, founder of Adopt-a-Village and the Maya Jaguar High School, oversaw construction of a new middle school for indigenous youth in remote northwestern Guatemala. With the help of a District 5110 matching grant, Rogue Gateway helped provide scholarships for several students attending the school. In 2017, Rogue Gateway President Doug Walker inspired Rotarians from all four Josephine County clubs to help pull down and dismantle an old hops barn on the Raptor Creek property, making way for a new parking lot. Raptor Creek Farm is where the Josephine County Food Bank is located. Rogue Gateway Rotary annually illuminates the Asante Center for Outpatient Health with the End Polio Now logo — marking “End Polio Day,” (Oct. 24). The giant red and gold logo is visible from Redwood Highway, projected onto the west side of the multi-story building at 537 Union Ave. The event is part of an October tradition in which community-based Rotary clubs illuminate landmarks and iconic structures around the world with the humanitarian group’s pledge to eradicate polio. Other illumination sites have included the Tower of London and the Sydney Opera House. Little Free Libraries have been placed in several Grants Pass neighborhoods, a project undertaken by the Rogue Gateway Rotary Club Literacy Committee. The goal is to promote reading and education as well as build community-building. The Little Free Libraries are stocked with books for children, adolescents, and/or adults. Rogue Gateway Rotarians and friends build and paint the libraries themselves. The libraries are located in front of neighborhood houses with permission of the homeowners, who have agreed to keep an eye on the libraries and keep them filled with books. The Rotary Duck Derby has become one of Josephine County’s most important fund-raising efforts, bringing in more than $1.3 million in 14 years to help the county’s children. The top prize is $15,000 toward the purchase or lease of a new car with proceeds helping fund all-weather tracks at the high schools, Morrison Park, a new Josephine County Food Bank storehouse. livestock pens for 4-H at the Josephine County Fairgrounds, and a splash feature in Riverside Park. 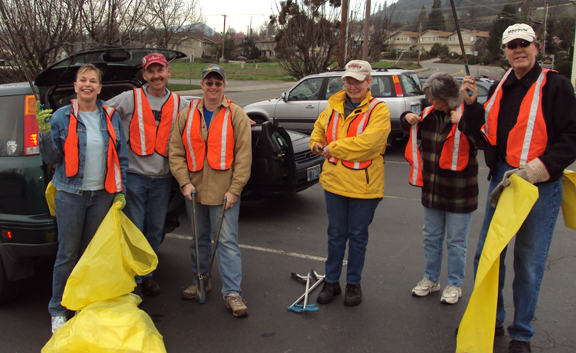 Rogue Gateway Rotary members and friends done orange vests and quarterly pick up trash along the Grants Pass Parkway. Bags, vests, and other tools are provided by the Oregon Department of Transportation.